Jessie’s Garden with Wilson aka Rogers Chapel Cemetery visible in the distance. The Jessie’s Garden cemetery is adjacent to the Wilson Cemetery on state highway 17, north of Florence, Alabama. Turn right (East) onto County Rd. 142 just north of the Rogers Chapel United Methodist Church. Go approximately 200 yards and the entrance to the cemetery is on the right. 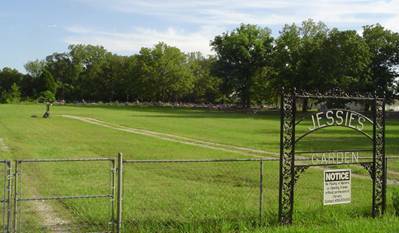 This cemetery was founded by Roy Patterson Jr. and is named after Mr. Patterson’s mother. Ironically, Mr. Patterson was the first person buried in the new cemetery. Givens, Rhonda June; b. 09 Jan 1963, d. 02 Apr 2007, wife of Randy L.